Save an extra CDN$ 19.21 (44%). Buy the Kindle Edition instead. Newly-retired, ex-Chief Superintendent Fran Harman and her partner Mark have volunteered to assist West Mercia police in reinvestigating an unsolved crime. Twenty years ago, a car was found abandoned on an isolated road running through the Wyre Forest, its hazard lights still flashing, the passenger door open. In the back, were two child seats. One was empty; in the other lay a desperately ill baby. Neither the baby’s mother nor the elder child were ever seen again. Where had Natalie Foreman been and where was she heading? As they question those who knew the missing woman, Fran and Mark uncover worrying discrepancies and mistaken assumptions underlying the original police investigation. In their new role as civilians in a police world, they find themselves encountering hostility and resentment from some of those they question – and it’s clear that more than one key witness is not telling them the whole truth. Start reading Green and Pleasant Land (A Fran Harman Mystery Book 6) on your Kindle in under a minute. Having been aboard for this entire series, I completely understood the reasons for both Fran and Mark retiring from their high-stress positions in the police force. One of Cutler's strengths is giving readers so much insight into both the characters' personal lives and what is happening in the modern world of policing that we feel we have our fingers on the pulse of what's really going on. The changes Fran and Mark experience are organic. They are a natural part of the series narrative and don't come across as some unknown supreme being throwing down stray lightning bolts. Yes, occasionally there are multiple plot threads running at the same time, but life gets messy. Seeing how Fran and Mark deal with personal life issues and complicated investigations make them all the more real to me. This cold case is perfect for the pair's talents. They're expert in police procedure, and they excel at dealing with the personality quirks of all sorts of people. If something becomes difficult, they just work harder, and they often find the strength they need in their relationship. The setting and the case itself are mysterious and-- with the incessant rain-- water-logged. When the pace becomes sluggish from time to time, a lot of it is due to the fact that the rain indeed has an effect on what they have to do. As Fran and Mark uncover more and more people hiding secrets and motives, the animosity becomes almost Christie-esque. Does everyone have a hand in the woman and child's disappearance? Are there too many suspects? It certainly can feel that way. 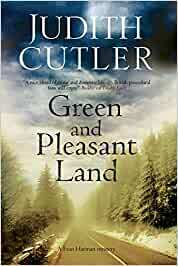 Green and Pleasant Land is another strong entry in one of my very favorite British police procedural series. It is a series I highly recommend, and I would suggest starting at the beginning because the events in Fran Harman's life are key to the books. These aren't books that merely feature a murder of the week, tie everything up in a big bow, and then fade away until the new case in the next book. No, this series immerses us in the life of an exceptional woman, her life and her work. It reminds me most strongly of Deborah Crombie's excellent Duncan Kincaid and Gemma James series. I can't get enough of Crombie's characters, and I certainly can't get enough of Judith Cutler's Fran Harman. Irony, conspiracy, anger, abuse and police corruption, judiciously blended with persistent bad weather. What more can regular readers of British crime fiction expect or desire? Author Cutler is an experienced successful author with many solid novels to her credit so readers will expect and receive everything a well-conceived examination of a water-soaked community, West Mercia, in Northern England will entail. Two former cops with sterling records, Fran Harman and her husband, Mark Turner, now retired from the active police service are called north to help a newly conjoined police force in clearing out their old unsolved cases. In this instance, it’s the disappearance of a popular member of the community, married to an even better known footballer. Ten years earlier, Natalie Foreman, mother of two boys, and wife of star striker Phillip Foreman, disappeared, leaving behind in her sedan beside the roadway, one dead son. Her body and that of her other son, Hadrian, are never found. Foul weather hampered the search. Hence the case is still open. Fran and Mark are disconcerted to discover, upon arrival, per their contract, that there are forces arrayed against them, some blatant, others more subtle and thus more dangerous. They have to sort through a lot of stuff including personal attacks to solve the mystery. The writing is excellent, smooth and consistently logical. The opening prologue is like a sock in the gut. Character development is also excellent with some interesting and unusual characters, scenes are well-tended and the narrative is tightly secured. The novel moves well, although there are instances toward the end which seem a bit convenient and somewhat hurried. Still, a reader is left to contemplate a nicely presented turn of moral complication at the end. And a reader would ponder long over whether to move to reside in such a green and unpleasant land. This is the first book I have read by Judith Cutler, so I didn’t know what to expect. I like British procedurals and I loved this novel by Cutler. I was easily able to catch up on necessary background information of both Fran and Mark, the two main characters, and greatly enjoyed the story. The book is extremely well-written. The descriptions of the setting and characters are wonderfully vivid. I could feel the chill and dampness in my bones as I read about Fran and Mark’s misadventures in their rented cottage. I love that a husband and wife detective team are the main characters and really liked seeing how loving and respectful they are of each other, personally and when on the job. I love the perseverance they both show, determined to solve the case even when every obstacle is thrown in their way. The pair is investigating a cold case, but the investigation seems immediate and urgent and kept my interest from beginning to end. The side characters, some nice and some not-so-nice, are all realistic and add to the depth and excitement of the story. I liked how the case wrapped up, but was left wanting to read more about Fran and Mark. “Green and Pleasant Land” is the perfect book for readers who enjoy the intelligence and wit of a well-written British procedural, such as those by Cynthia Harrod-Eagles. I will definitely be seeking out more books by Judith Cutler. I received this book from NetGalley, through the courtesy of Severn House Publishing. The book was provided to me in exchange for an honest review.